There was no immediate response to the report from the US State Department. Iran says it only wants to produce nuclear power but the International Atomic Energy Agency suspects it is attempting to develop nuclear weapons. In the United States, Obama has come under pressure to take military action to destroy Iran’s suspicious facilities. He condemned “loose talk of war” this week but has stressed that all options are open. A Reuters/Ipsos poll on Tuesday indicated that 56 per cent of Americans would endorse strikes against Iran if there were evidence of it having a nuclear weapons capacity. Israel has also indicated it could launch a unilateral attack. 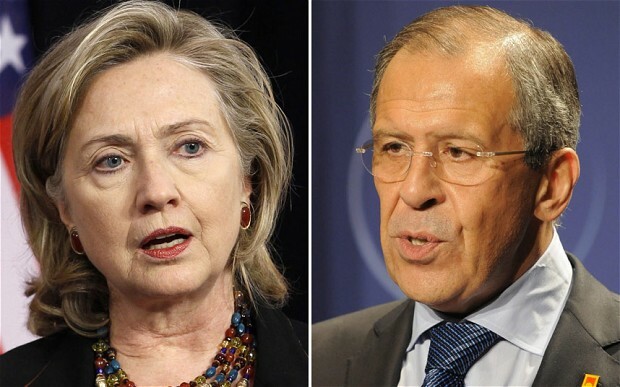 Mrs Clinton and Mr Lavrov are said to have discussed Iran when the two met in New York on the sidelines of a UN Security Council session on the Middle East on Monday. Russia has longstanding ties with Iran and helped it build the Bushehr nuclear power plant. Moscow itself would be very unlikely to endorse military strikes against the regime, and Sergei Ryabkov, a deputy foreign minister, told Kommersant that such threats were “unprofessional”. “There is never a last chance,” he said. However, the Kremlin’s leverage means it could impress the seriousness of Washington’s intentions on Mahmoud Ahmadinejad, the president of Iran. Nuclear talks – involving Britain, France, Russia, China, Germany, the United States and Iran – are expected to be held in Istanbul, Turkey, next month. Mr Lavrov did not mention Iran during an appearance before the State Duma, the lower house of parliament, on Wednesday, choosing to focus on the Syria crisis, where he called for an immediate ceasefire between government forces and rebels. The foreign minister also defended Russian arms supplies to President Bashar Assad’s regime, saying they were meant to protect Syria from external threats. “We aren’t providing Syria with any weapons that could be used against protesters, against peaceful citizens, helping fuel the conflict,” Mr Lavrov said.